As you might suspect, I’ve got a lot of thoughts to get through on what was one of the most interesting drafts that I can remember. Rather than write a 10000 word post that covers everything, I’m going to split my analysis into several parts (probably many) and try to focus on just one aspect of the event each day (today’s post is 1470 words). While I am very tempted to talk about the QB class today (and the completely unprecedented fall of Barkley/Nassib), I’ve decided it makes more sense to focus on the Eagles’ draft and get that out-of-the-way. So how did the Eagles do? In a word: OK, and perhaps as well as they could have under the circumstances. By now I’m sure most of you have read at least one “grade the draft” article, so I think it’s a good time to tell you that “grading the draft” articles are completely devoid of value and utterly pointless. The “grades” are determined by each writers’ individual opinion of each prospect, which as we know, is likely worthless. Needless to say, I will not be grading the Eagles according to which players they selected. I have no idea if/how each will work out, and neither does anyone else. I will, however, talk about value, and what information we can infer from each pick. This is not a one year process. For those of you that are disappointed at the lack of attention to Defense, remember that reaching for “need” is what gets you Jaiquan Jarrett and Danny Watkins. The draft is about playing the odds the right way. I discussed him on Friday, so I won’t go into too much depth now. He was, by all accounts, a “top tier” player in this draft. Also, Kelly claims the team did not receive any interest from others trying to trade up. Those two factors, in combination, suggest the Eagles did as well as they could have. I’m not entirely sure whether I believe Kelly or not. I noted that the lack of interest in any free agent OTs was puzzling, but made complete sense if the team was 100% sold on one of the top OT prospects. It’s possible then, that the Eagles had their sights on Johnson the entire time and had no interest in trading down (which would be a “value” mistake). Kelly has claimed that he/Roseman had 4 players in their top tier, with Dion Jordan and the other top OTs rounding out the group. This is pure speculation, but I doubt Jordan was ever actually included. I think it’s more likely that the Eagles smokescreen worked to perfection, forcing the Dolphins to trade up for Jordan, leaving Johnson to the Eagles. In any case, Johnson has the potential to provide a big upgrade to the OL. Also, he’ll eventually replace Jason Peters at LT. In one pick, the Eagles solidified the RT, RG and future LT positions. All in all, it was likely a good selection. This one might have caught casual fans by surprise, but everyone who’s been paying attention knows it was always a possibility. Ertz has the potential to be a real weapon at TE, which Eagles fans haven’t really experienced. On pure talent and potential, there is nothing to dislike about this pick. Close readers will note that Ertz was ranked 50th in both the Consensus rankings and the TPR system, making him a slight reach at #35 overall. However, I’m not too concerned about that, since Chip Kelly will likely use him much more extensively than the model accounts for. In general, fans should be relatively excited about Ertz. The most interesting thing about the Ertz pick is what it potential says about the Kelly/Roseman dynamic. Basically, I think Kelly has a lot more say in personnel matters than we were led to believe. It is possible, of course, that Ertz was Howie’s BPA at #35 and the Chip had little to do with it. 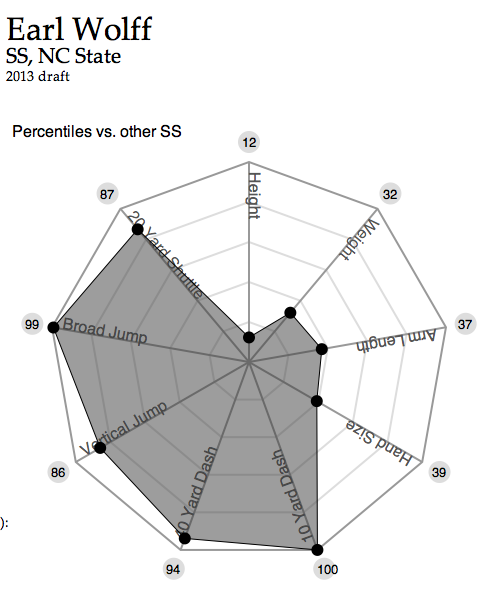 However, given Chip’s widely known love of TEs I think it’s far too coincidental that the BPA just happened to be a TE. Objectively speaking, the odds of that seem low. Also, back when Chip was interviewing, it was widely assumed that he would only go somewhere that granted him a large measure of control. It came as a surprise that Kelly would choose to go somewhere where he not only didn’t have personnel control, but had to defer to a relatively inexperienced GM like Howie. I think the Ertz pick make it pretty clear that Howie Chip has a very significant say in roster decisions. Note that I’m not suggesting that’s a good or bad dynamic, just that it’s different from what we thought. This is the only pick I really had an issue with. The consensus rankings had him at #92 overall, and my TPR system had him #100. Neither of those rankings should be taken as definitive (the TPR is essentially still in Beta), but it suggests Logan was probably not a great value at #67 overall. I won’t get into the scouting report, but it’s safe to say this is the least exciting pick the Eagles made. He’s not a perfect fit at any position, but will probably play NT for the Eagles (maybe DE depending on the situation) and move inside to DT when the defense is in a 4-3 alignment. Granted this was a 3rd round pick, so the odds of finding a good player here aren’t great to begin with, but this is the only “mistake” the Eagles made. The team clearly values Logan more highly than most others. As readers should know, that usually means the team is wrong. Hopefully that’s not the case here. I’m going to do a complete post on just the QBs tomorrow, so I will try to hold most of my thoughts until then. I’ve got several theories for why the draft played out the way it did. Regardless, I think Barkley was a fantastic pick. The biggest issue seems to be the amount of press it generated and the potential distraction it creates. So let me break this into a few smaller pieces. – Saying Chip got “his guy” is ridiculous and betrays an almost complete ignorance of how the NFL works. If Barkley was “Chip’s guy”, he would have been selected much earlier. – This definitely allows us to infer more information on Chip’s system and the QB depth chart, but I’ll explain that tomorrow. Hint: I think this helps Nick Foles a lot. – Barkley is a 4th round pick. Treat him like one. That means stop hyperventilating and getting excited about potential “Barkley greatness”. I like him and think he was a tremendous value in the 4th round, but there’s a reason (a few of them) that he fell that far, and it’s probably not because every team ignored how great he is. – It looks to me like Barkley’s “floor” is probably as a competent back-up. Note his “ceiling” might not be much higher, but the fact is that a good back-up QB is easily worth a 4th round pick. – I’m not sure, in the entire history of the draft, that I can find a better example of a low-risk/high-reward draft pick. The “investment” of a 4th round pick is very small. You’re odds of finding a “starter” are fairly low, and the odds of finding an “impact” player are almost non-existent. If Barkley has even a 5% chance of being a “great” QB, then this was an unbelievable pick. If week one arrives and a player drafted in the 5th round or later is starting, it’s much more likely a GLARING WEAKNESS than it is a draft steal. This entry was posted in Draft by Brent. Bookmark the permalink. Either that or this 3rd cup of Starbucks today is really going to my head! a. He simply doesn’t ‘look’ like a successful quarterback. His body type is downright hideous for a QB. He looks shorter on tape than he actually is. He looks like Barney Rubble. When I first watched him I thought he was 6′ in cleats. He looks shorter than he is. And someone needs to tell him to lay off the chest presses (after typing that now I gotta go find out how he did on the CP at the combine). Definitely meant Kelly, not Howie. Thanks for the catch. Tomorrow I’ll give you my thinking on why Barkley and the other QBs dropped. A) That probably played a role. While you wouldn’t think 6’2″ would be considered small, it’s not “ideal” for an NFL quarterback. I think that’s overblown. He’s tall enough to see over the line, that’s all that really matters. B) The USC baggage and “california” reputation may have played a role, but if it did it’s because NFL teams didn’t do their homework. Clearly this kid is completely different than Sanchez/Leinart. He’s humble, which is obviously nice to see, but more importantly, he’s a noted “gym-rat” and has a great work ethic, which is a pretty big requirement for NFL success. Look for my post tomorrow, as I’ll delve into the QB topic in a LOT more depth. I think you meant Chip, not Howie. Not trying to nitpick, just helping readers not get confused. Ugh never mind. Serves me right for not refreshing the page. Just the facts. I’ve been enthusiastic about the draft. I recognized that Barkley represents a potential phenomenal value. Still, yours is the first balanced assessment that made me believe that the Eagles may not have hit a grand slam. Thanks for objectively tamping my uber-enthusiasm. Ill have more tomorrow, both positive and negative. I’m excited we drafted him, but we need to keep things in perspective. Okay, so Earl Wolff is a little undersized. That doesn’t mean he can’t be good. Just don’t stick him in 1 on 1 coverage with Calvin Johnson. I agree though that the majority of people drafted in the 5th round or later won’t be impact players. A lot of them won’t even make the team. But there is always the chance that you find a hidden gem, and I think that Chip and Howie did a good job of picking guys in later rounds that could have a lot of upside. Side note: The punter they signed after the draft (brad wing) is good enough to win the spot, assuming his glaring character issues don’t get in the way. True. I didn’t mean to suggest that none of the late round picks have ANY chance at being significant contributors, just that far too much is made of them. Maybe one turns out to be a gem, but the fact is NOBODY has any idea which of them it will be. I didn’t mention it, but P/K are different. Wing has a much better chance to be good than any of the other UDFA pickups or late-rounders.